Newly promoted Hoops Club (LBL) strengthened their roster with addition of 31-year old Senegalese international forward Ibrahima Thomas (213-109kg-87, college: Cincinnati). He played last season at ES Rades in Tunisian Division I. He helped them to win the league title and the cup. 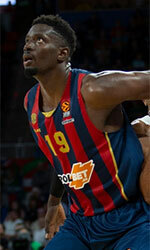 Thomas also played for Saitama Broncos (B League D3) in league where in 26 games he recorded 14.6ppg and 6.2rpg. 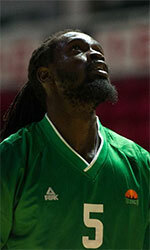 He also represented Senegal at the Afrobasket Championships in Abidjan (Ivory Coast) five years ago. Thomas' team won Bronze and his stats at that event were 7 games: 3.0ppg, 3.1rpg. Thomas is quite experienced player. Thanks to his pro career he managed to play on three different continents (Europe, Asia and of course North America) in five different countries. Thomas has played previously professionally in Bahrain, Iran (Azad), Qatar (Al Sadd), Saudi Arabia (Al Hilal and Al Ittihad) and Spain (Caceres Basket). He attended University of Cincinnati until 2012 and it will be his seventh season as a professional player.